PEANUT BUTTER- The Good, The Bad, and the Ugly.... - Real Food. Real Fitness. 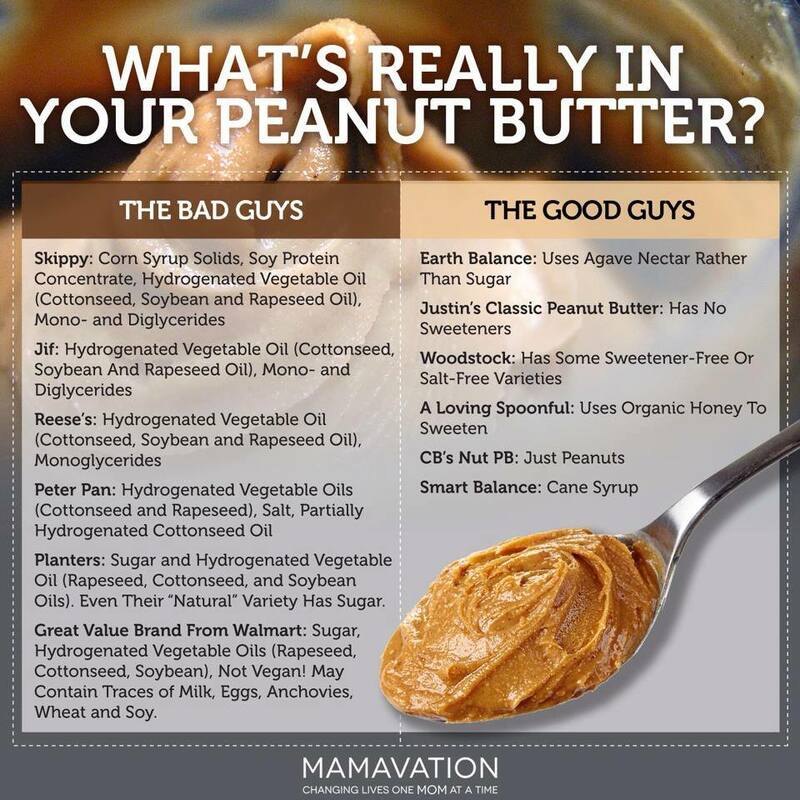 PEANUT BUTTER- The Good, The Bad, and the Ugly…. Oh how I LOVE peanut butter! Ever since I can remember nothing tastes better than a spoonful of creamy peanut butter right out of the jar. Its texture and taste combined are oh so satisfying. Indulging (in moderation) especially during pregnancy has been a guilty pleasure of mine. But hey its peanut butter made from nuts so it has to be healthy right? Well, it depends. First let me point out that peanuts aren’t technically nuts, they’re legumes and from a health standpoint peanut butter can be good and bad. Lets start first with the GOOD…. A Serving of peanut butter has 3 mg of the powerful antioxidant vitamin E, 49 mg of bone-building magnesium, 208 mg of muscle-friendly potassium, and 0.17 mg of immunity-boosting vitamin B6. It contains a combination of fiber (2 g per serving) and protein (8 g per serving) that fills you up and keeps you feeling full longer. Peanut butter is a fairly balanced energy source with the right combo of carbs/fat/protein ratio, which means it will keep you fuller longer and provide decent lasting energy. 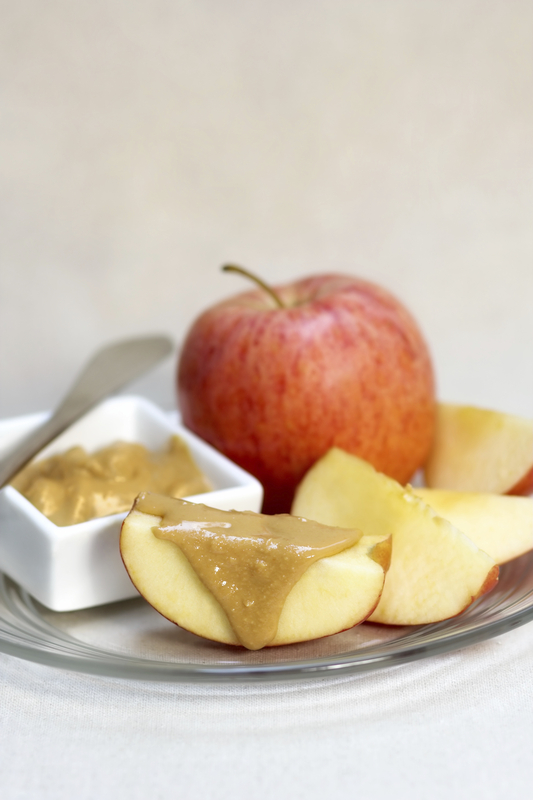 Plus its just yummy spread on apples or celery or mixed in a smoothie for a great snack. About 30% of the fatty acids in peanut butter are the Omega-6 fatty acid linoleic acid. Most people today are already eating too many omega-6s and not enough omeg-3s. Too much Omega-6 fatty acids in the diet are associated with inflammation and an increased risk of cardiovascular disease. Peanuts actually grow underground, where they tend to be colonized by a fungus called Aspergillus, a source of aflatoxins… which are toxic and highly carcinogenic. The long-term effect of buildup of these aflatoxins in our bodies is unknown. These toxins can also wreak havoc on our gut health and bacteria balance. But good news is that processing the peanuts into peanut butter reduces the aflotoxins more than 80%. Only if you are eating peanut butter regularly should you be concerned about these toxins. Peanut allergies are one of the most common food allergies. Peanuts can cause a severe, potentially fatal, allergic reaction for some people. For this reason its best to be cautious with where you are eating PB or whom you are sharing any PB with. Peanut butter is a relatively unprocessed food. Sadly many commercial brands of Pb are NOT REAL peanut butter. They are loaded with added sugar, preservatives, and other nasty things. REAL peanut butter is just peanuts, often roasted, that are ground until they turn into peanut butter. REAL peanut butter needs to be stirred once opened. REAL peanut butter should have a label that reads ORGANIC ROASTED PEANUTS that’s all! I have a few trusted REAL brands I purchase at my local health store. This is a great chart (shared via www.mamavation.com) that should help when shopping on what to AVOID. I don’t agree with the Earth Balance or smart balance brand in the “good guys” due to the agave Nectar and cane sugar. Stick with organic brands that contain only dry roasted peanuts and salt as the ingredients, thats it! I am currently loving the brands Naturally Nutty with flax and hemp seed and Santa Cruz organic. Bottom line: PB can be ok in moderation but be sure to buy only REAL organic peanut butter and ditch the fake conventional brands!! Be Well :-), Susie R.